The announcement signaling the dissolution of Victory Motorcycles came as a shock to many riders. I would love to say I was prescient enough to see it coming, but while I found the announcement unexpected, I did not find it surprising. Polaris Industries is a massive company, featuring 17 brands, 13 offices or manufacturing locations in eight countries (USA, Canada, Australia, Britain, Germany, Spain, Sweden and Norway), and somewhere in the neighborhood of 3,000 employees. The company had $4.719 billion in revenue in 2015 and earned a net income of $455.4 million that same year. In addition to motorcycles, Polaris manufactures snowmobiles, ATVs and small electric vehicles (think golf carts) and has extensive defense contracts around the world. They used to make jet-ski-style watercraft, too, but got out of that business when it stopped being profitable. At any rate, motorcycles were about 15 percent of Polaris’ business in 2015, a high point in a year that saw declining sales in other segments (ORVs down 20 percent, snowmobiles down 25 percent). Which is exactly what they’re doing with Victory. 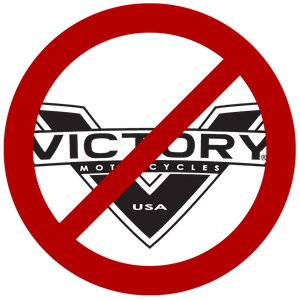 Victory motorcycles haven’t been making Polaris enough money to warrant continuing the line, especially in the light of the unprecedented success of Indian Motorcycles. Polaris bought all the name rights and intellectual property involved with the Indian Motorcycles brand in 2011. In 2013 they announced they would start production, and in 2014 they started showing off their new Indian motorcycles. Now – in early 2017 – Indian has multiple models in their catalog ranging from a “starter” bike (Scout 60) to a full-dress touring rig (Roadmaster). I imagine that gunning up Indian was a huge risk for Polaris, and they probably figured that if it all went sideways, at least they’d still have Victory. I also imagine that they are pleasantly surprised at the wide (and fast!) embrace given to Indian motorcycles when they hit the streets. Those bikes are a near-perfect combination of technology, style and – most importantly – history, and they have resonated with the American public. Indian sales have been driving Polaris’ motorcycle segment since their introduction in 2014. Polaris’ motorcycle revenue jumped 94 percent from Q3-2014 to Q4, a jump brought about by the initial sales of Indian motorcycles. In the same quarter, Harley-Davidson sales numbers dropped 3 percent, even though earnings rose 10 percent. Motorcycle sales rose for Polaris in 2015 as well, with their year-end report showing a 67 percent increase. In Q1-2016, Polaris’ motorcycle sales rose 18 percent. That quarter, Victory introduced the Octane (a mid-sized cruiser) and Indian introduced the Springfield, a more or less standard cruiser with a bolt-on windshield and some other add-ons built into the base price. Further, Harley’s global revenue rose 5% to $1.3 billion. Polaris’ motorcycle revenue was just $188 million, and it’s important to keep in mind that there are few Victory or Indian dealerships overseas. What’s hidden in those early 2016 numbers is a 50 percent rise in Indian sales. When Harley holds 51 percent of the market share, a 50 percent rise in the sales of any one other brand is significant. Anyway, back to my main point. It’s obvious that Indian sales have been outpacing Victory sales, and Polaris made the strategic decision to drop Victory and focus on Indian. I think it’s smart for Polaris to focus on Indian, because Indian has what Victory didn’t: 100 years of legacy and brand recognition. Mystique, if you will. Victory’s 18-year run was as successful as you could probably expect from a ground-up motorcycle marque, but in the end it wasn’t enough to overcome Indian’s American legacy.